Carter House was interested in assessing the relax chair’s potential in providing a calming, multi-sensory experience, and wanted to share their observations of some of the benefits enjoyed by their residents’ use of the relax chair. Homer, a Dementia resident who struggles with sleep and behaviour issues, as well as aggressive language, became the first resident to use the chair. "The rocking consists of continuous movement of the chair in a forward and backward direction"
Homer was started with a 20-minute cycle that included music therapy, and rocking and tactile simulation; he was also covered with the included weighted blanket during the entire cycle. Built-in speakers at the head section of the backrest provide the music therapy. The rocking consists of continuous movement of the chair in a forward and backward direction for the duration of the pre-set programme, while the tactile stimulation is provided by a sub-woofer speaker in the backrest portion of the chair. When finally safely positioned in the chair, the weighted blanket and a pillow in place, soothing music playing, and the chair gently rocking, Homer was asleep in about 10 minutes. The chair was affectionately dubbed the “Big Red Chair.” Many of the residents took turns trying it, some staying longer than others. Only one resident would not try sitting in the chair again. Without exception, all the other residents got something out of the chair. This could mean a few minutes of peace, a few minutes of calm and tranquility. Perhaps a few minutes where they could let go of their worries and just relax, and be at peace with themselves. "This could mean a few minutes of peace, a few minutes of calm and tranquility"
Dementia, through its many forms, is a disease with many challenges. Struggling to find peace is a common occurrence among those affected. They will often pace or talk endlessly, finding difficulty being at ease around others. For a short time, however, the Wellness Nordic Relax Chair gave the Carter House residents the ability to relax. It provided them with an opportunity to find the sort of peace that eludes them. 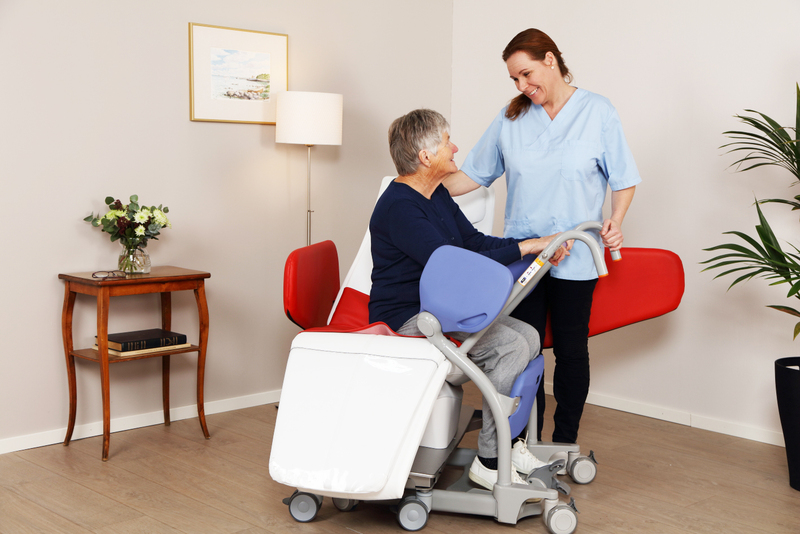 This chair would be an asset to any facility dealing with the challenges of Dementia care. Disclaimer: The opinions given by the nurse in this user evaluation are not necessarily those of Arjo AB or Wellness Nordic. The amount of relaxation generated when using the Relax Chair will vary between chair users. Any modification in prescribed medication is to be determined by a clinician and should never be determined solely on the basis of length of usage of the Relax Chair. This user evaluation was initially provided by Mary McDonald, RN Manager at Carter House Lifecare, Te Puke, New Zealand.